Gabaldon usually writes mega-historical novels that weight more than a truck tire, but this spin-off series is more like a sedan tire. 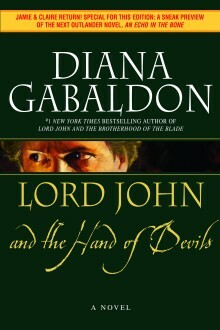 The trilogy of novellas re-introduces one of her compelling secondary characters, Lord John Grey, who walks an elegantly tight line between social acceptance, and disgrace and incarceration. He’s gay, you see, and while there seems to be no shortage of gays in his 1770’s English world, they are all under threat, and for the most part keep their lights hidden under very discrete cover. But threats come from many places. Read this delightful little book some weekend, and get swept into the well-drawn era in which treason abounds, witches ride the night sky, and canons roar. It’s a 4.